The car's chocolate-colored exterior is faded and, without a leather cover, the steering is scorching hot in the sun. 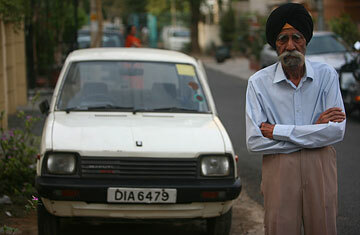 The Maruti 800  India's original people's car before the Nano came along  looks dated. The modest hatchback, and the Bajaj Chetak, India's answer to the Vespa, captured the imagination of the Indian middle class in the 70s and 80s and kept them buying for decades. But the small car and the scooter, long ubiquitous on roads throughout India, are no longer the toast of India's aspiring middle class. Over the last month, both companies have announced that they will be phasing out these beloved classics. The announcement, though sudden, was not surprising. With the staid middle-aged consumers of India's middle class giving way to urbanites and youngsters with a lot of disposable cash, not much hope was left for these two modest modes of transport. A Maruti-Suzuki spokesperson says the company made a conscious decision to phase out the car as the definition of "people"  in order words, India' vast middle classes  has transformed in the last two decades. In January 2010 sales of the M800 were down 55% over the same period the previous year as Indians opt for cars with features like power steering, more contemporary styling and new technology like fuel efficient engines. The scooter, meanwhile, has lost its appeal among the younger generation for not being macho enough. The two-wheeler has always been associated with teachers, professors and government clerks and is considered too "serious looking" for young people, says Rahul Bajaj, chairman of the Bajaj group. Waiting lists for Bajaj scooters are a thing of the past. The picture was different in the 70s, when every young man's dream was to fly across the roads with his sweetheart on a Bajaj scooter. In north India, marriages meant a Bajaj scooter as dowry, Bajaj has said. Tejinder Singh, a retired brigadier in the Indian army, remembers his first Bajaj scooter that he bought with a loan of $70 in 1973. In those days of bicycles, a scooter felt like a royal luxury. "Riding in the night, with my wife at the back, her hands gently holding me was the most romantic feeling," he says. Like many, Singh progressed from his Bajaj to an M-800 in 1987. "I was an army major by then and it was only fit that I should buy the M-800," says Singh. "It was not only a status symbol, but a vehicle of the times." He drove the little car for nearly two decades, and says it witnessed a major portion of his life story. "My children and grandchildren have all been part of that experience. If my wife were alive today she would have never allowed me to sell it," he says. "To this date, I associate the car with her." Even until recently, the M-800 was a first car to many Indians. Indu Bhandari, a mother of two, says when she and her husband wanted to buy their first car in 2003, M-800 was the inevitable choice. But with the introduction of snazzier models from domestic and international car makers, the M-800 has been losing its sheen over the past few years. As Bhandari says, when her parents bought their M-800 in the 80s, people were awed. By the time she bought hers, it was looked down upon  good as a first car, but nothing more, Bhandari says. An era will end in India when shiny new Chetaks and the Maruti 800 disappear from India's streets  an era that marked the emergence of a modern India struggling to align its traditional values with modern aspirations. As Singh put it: "It was good while it lasted, but now its time to move on."